This comprehensive how-to manual covers the basics of the internal corporate tasks. It also gives an overview of the entire relocation industry, the service providers, where they fit into the process, and how to negotiate and work with them. An outline of relocation policies, household goods movement contracts, advance marketing and home purchase programs, guidelines for interfacing with the transferee and family, and dual career issues are presented in detail. 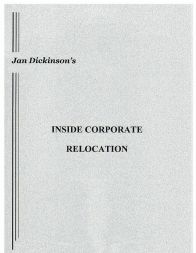 This is a complete training manual for the corporate relocation administrator.